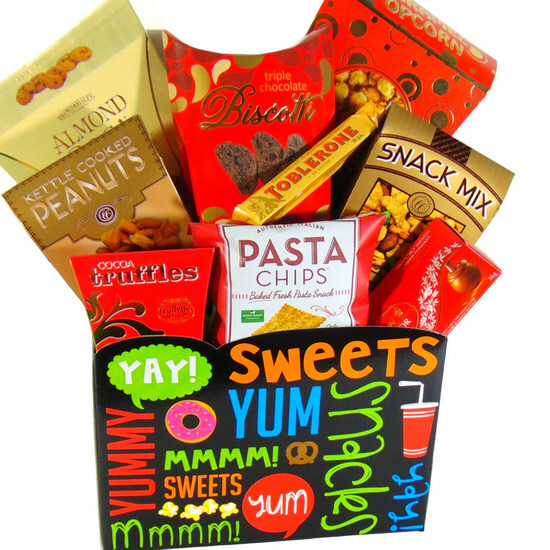 Snacks Gift Basket Toronto Free Same Day Delivery. Snacks gift basket with Yay! Sweets, Yum and much more words printed on an open gift box. Send this gift to anyone who loves sweets and snacks. Free Toronto hand delivery. 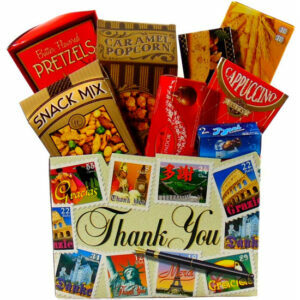 Gourmet food gift basket for any occasion. Mother’s Day, Father’s Day, Valentines Day, Happy Birthday, Thank You, Happy Anniversary, Congratulations, New Home, Happy Thanksgiving, get well soon, Sorry, Love you and New job, Graduation, Teachers Gift. 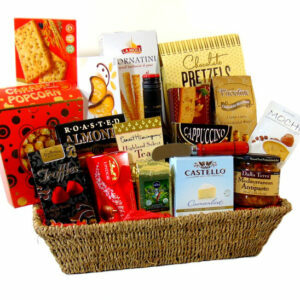 Sweet & Snacks gift basket gourmet food. Gift contains Chocolates, Cookies, Pasta Chips, Snacks Mix, Caramel Popcorn, French Truffle Chocolates, Chocolate Biscotti, Roasted nuts all the sweets and snacks to enjoy any special day.